New ventures are always exciting. And coming from years and years of experience, when industry veterans put their minds, hearts and souls into creating an entirely new dimension complete with the latest in technology – Artificial Intelligence! 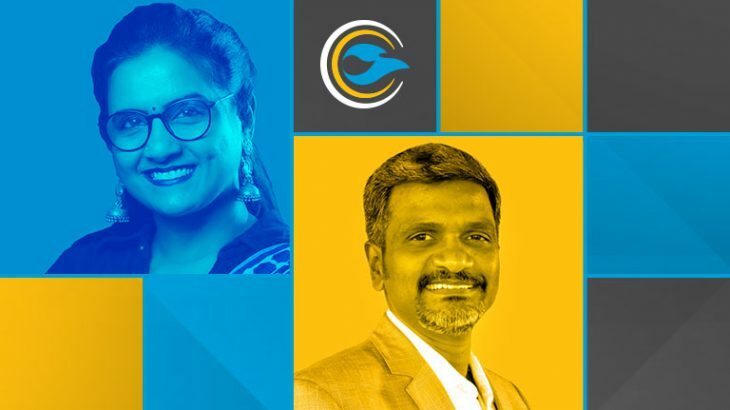 We, Team Bruhat, decided to meet these brilliant minds behind Bruhat Insights Global, Dr. Saundarya Rajesh (SR), Chairman and Mr. Umasanker Kandaswamy (US), COO & Joint Director and ask them more about our new company. Team BIG: Let’s begin from the beginning. What is the meaning of Bruhat? SR: Sounds beautiful, right? It is a Sanskrit word meaning “big”.Interestingly, the acronym of Bruhat Insights Global also reads BIG! Team BIG: Sanskrit is old, so is Bruhat new? US: Yes and no. The origins of Bruhat can be traced back to the time when we started investing in a robust data capturing mechanism that analysed data from hard-copy resumes, around 15 years back. Those were the days when electronic resumes were not popular. Back then, in order to capture the candidate’s conversation with the recruiter, we started what we called the “Dialogue Box”.This helped us leverage both the structured and unstructured data about the candidates. SR: In fact, remember Umasanker, we used it to capture the data for our AVTAR I-WIN portal, which is for women looking for a career opportunity. Team BIG: That’s interesting. So is Bruhat also for women only? SR: Bruhat Insights Global is clearly positioned for BAU hiring and RPO Solutions. It is NOT gender specific. Team BIG: Ok, got it. Now, how did AI get into the picture? Is it because it’s the trend or does it really add value to the process? SR: Artificial Intelligence is indeed the flavour of the season, but its value lies in the difference that it makes to the success of the hiring process. Only a small percentage of talent acquisition professionals actually derive value from using it. The possible combinations of keywords, skills, natural language processing inputs are nearly infinite. Ensuring that this Big Data is examined using AI-driven analytics is perhaps the most efficient if not the ONLY way to ensure that a recruiter is investing effort in pursuing the best possible candidate. How AI is actually applied within the recruitment solution is what determines its value. Team BIG: That’s true! But then there are many AI based Recruitment products in the market. What is the edge that Bruhat brings? SR: That is a very valid question. Clients of Bruhat have unfettered access to nearly 100% of the information that a recruiter gathers about the potential candidate during the profiling life-cycle, thereby increasing the probability of offer acceptance and joining. No job site or social media site, (including LinkedIn) is able to capture the extent of information that Bruhat’s AI tool processes. Team BIG: Fantastic! What is the “science” behind this process? US: The tool uses Bayesian inference- a basis for machine learning – to create the relative offer acceptance scores of a set of shortlisted candidates, and determines which candidate has the highest probability of acceptance. Information such as competency scoring, identity cloud capture, keyword cloud capture and prior offer acceptance patterns are analysed with individual weights and priorities to ensure interview optimization. SR: Also, Bruhat uses a cutting-edge Candidate Data Platform, a unified, integrated storage of all profiling data. The tool tracks the careers of candidates including both pre-offer and post-offer behaviour, which is critically important in the selection of the right candidate for the job. Defined as ‘Acceptance Attribution’ — assigning weights and credits to everylife-cycle touchpoint – this ensures that a simple talent funnel becomes a dynamic selection process that optimises ROI on Talent acquisition effort. Team BIG: Very important for these times when candidates are “Ghosting”. SR: That’s the core issue that Bruhat looks to solve! I am glad you brought that, “ghosting” is the menace that the hiring managers are facing today, globally. Do you know, in India the rate is 35% – which is the number of potential hires who drop off the talent acquisition pipeline! US: In fact, it leads to about Rs. 1000 crores of loss for the industry, annually! Team BIG: Wow! But why should a company approach Bruhat for this service? Isn’t it easier to buy a product off the shelf, instead? US: That is where Bruhat brings its “Human” edge! The AI and Big Data Analytics will help our Virtual Assistant to make quick decisions. It definitely also removes human error in screening processes especially in volume based hiring. But, with our 75+ years of combined experience in Talent Acquisition, the team at Bruhat will bring a lot more to the table. Also now with data scientists and behavioural scientists, such as yourselves, added to the sourcing efforts, Bruhat has the human insights that will be the key differentiator. We are kick-starting a new path in hiring process, one that is cost effective and encourages productive interactions with candidates. Team BIG: What is the Vision of Bruhat? SR: Our vision statement reads, to – Empower organizations to Hire Bold by combining Human Intelligence with tech-driven insights. If we can give the hiring manager everything that will enable him/her to hire boldly – the complete information about the candidate, the analysis and prescription score – we would have done our job! Team BIG: What is this Prescriptive score? Sounds very techy. US: This is the Bruhat USP! The prescriptive score is the indicative score that will tell the hiring manager whether the particular candidate will accept the offer or not. For every candidate we go through 166 unique touch points in order to arrive at this score. Team BIG: What is the success rate of this Prescriptive Score? Team BIG: Oh wow! And that is how the companies can HIRE BOLD! Being Human In The Age of AI – Can We Draw A Line ?